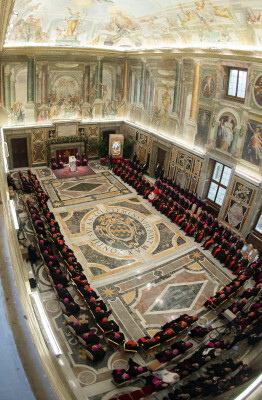 Una Curia Romana “semper reformanda”? In questo percorso risulta normale, anzi salutare, riscontrare delle difficoltà, che, nel caso della riforma, si potrebbero presentare in diverse tipologie di resistenze: le resistenze aperte, che nascono spesso dalla buona volontà e dal dialogo ‎sincero; le resistenze nascoste, che nascono dai cuori impauriti o impietriti che si alimentano delle parole vuote del “gattopardismo” spirituale di chi a parole si dice pronto al cambiamento, ma vuole che tutto resti come prima; ‎esistono anche le resistenze malevole, che germogliano in menti distorte e si presentano quando il demonio ispira intenzioni cattive (spesso “in veste di agnelli”). Questo ultimo tipo di resistenza si nasconde dietro le parole giustificatrici ‎e, in tanti casi, accusatorie, rifugiandosi nelle tradizioni, nelle apparenze, nelle formalità, nel conosciuto, oppure nel voler portare ‎tutto sul personale senza distinguere tra l’atto, l’attore e l’azione. Papa Francesco ci ha ormai abituati a questo stile e a questo linguaggio, per cui, a mio parere, non mette conto disquisire sull’opportunità per un Pontefice di esprimersi in tali termini: Papa Bergoglio è cosí; dobbiamo farcene una ragione. Mons. Georg Gänswein, nell’intervista rilasciata l’estate scorsa alla Schwäbische Zeitung, aveva giustamente rilevato: «Che nei discorsi, rispetto ai suoi predecessori, di tanto in tanto sia un po’ impreciso, e addirittura irrispettoso, si deve solo accettare. Ogni Papa ha il suo stile personale». 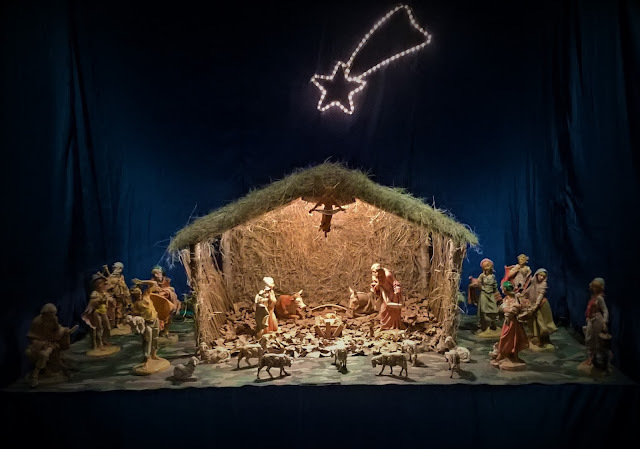 The Mass of Christmas Day, unlike that celebrated during the night, instead of presenting the story of the birth of Jesus, proposes the prologue of John’s gospel, thus inviting us to reflect upon the mystery we celebrate today. 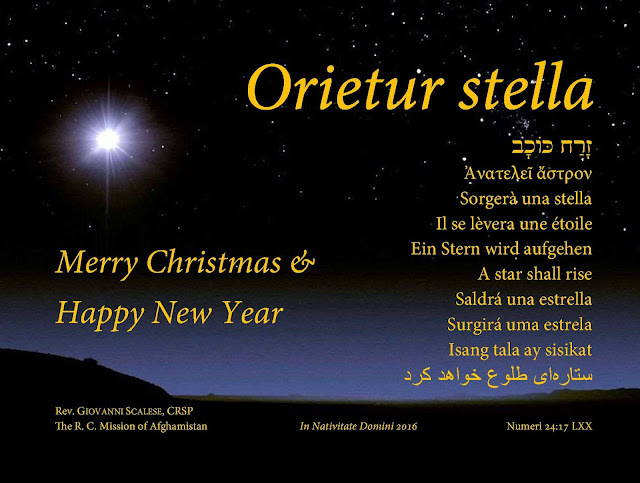 This year I have sent my Christmas greetings with a card saying in Latin: Orietur stella—“A star shall rise.” It is a prophecy we find in the book of Numbers, which reports four oracles of Balaam, a pagan soothsayer, to whom the king of Moab Balak had ordered to curse the Israelites headed for the promised land. But Balaam, instead of cursing the Israelites, inspired by God against his will, was forced to bless them. In his fourth oracle Balaam foretells what is going to happen many years later: “I see him, though not now; I behold him, though not near: A star shall rise out of Jacob, and a scepter shall spring up from Israel” (24:17 NAB/DR). The Jews saw in this oracle a reference to king David, who was a descendant of Jacob; Christians have always understood it as a messianic prophecy: the star and the scepter are symbols of Christ. On August 16, 2016 the website Cooperatores Veritatis published, under the title “The Church has to offer to man the truth, which is Christ,” a large-scale interview of mine about the current events of the Church. 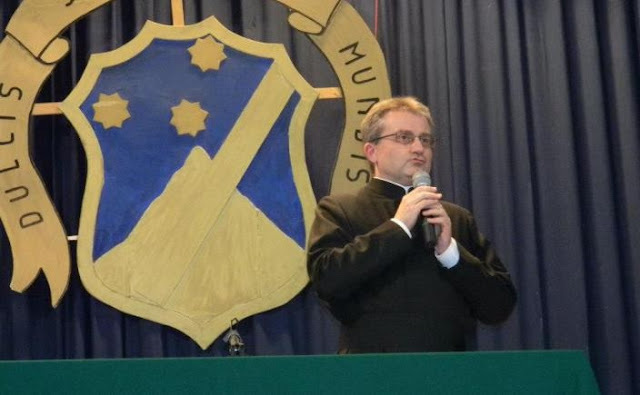 An American priest (who wishes to remain anonymous), having found it interesting, decided to translate it, so that it might have a higher spread, not only among the increasingly numerous readers of this blog in his country, but also among other people in the rest of the world, who do not know Italian, but understand English, which has become by now the lingua franca of the present day. We warmly thank the anonymous translator for his hard work, and willingly share the interview with all our readers. 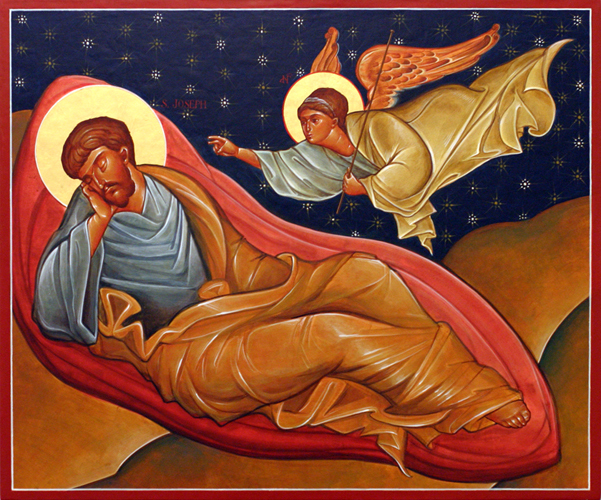 We are halfway through Advent. This third Sunday is traditionally named Gaudete after the first word of the Entrance Antiphon. 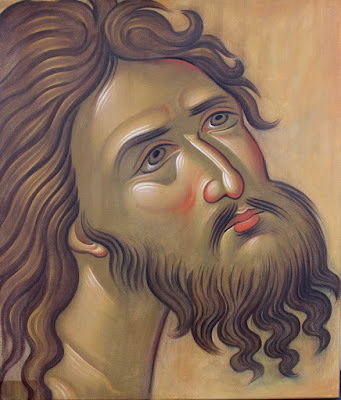 It is a quotation from the letter to the Philippians (4:4-5), where Saint Paul invites us to rejoice in the Lord. Why? Because “the Lord is near.” Yes, the coming of the Lord is drawing near; and so, we should be happy. Even the liturgical color the priest wears today is not the gloomy purple used during Advent and Lent, but the more cheerful rose. Our heart should really be overflowing with joy for the imminent coming of the Lord. Un lettore, facendo riferimento al mio post del 6 dicembre, mi ha segnalato due articoli, uno di Giacinto Butindaro e l’altro di Angela Pellicciari, riguardanti la “propinquità dello scautismo con la massoneria”, chiedendomi: «Non crede che questa sia tutta la verità?». We have prepared for this solemnity praying, for twelve days, the “Crown of twelve stars.” It is a chaplet—so named after the crown with which in the book of Revelation the woman clothed with the sun was crowned—whereby we consider the twelve main privileges of the Blessed Virgin Mary. What is a privilege? 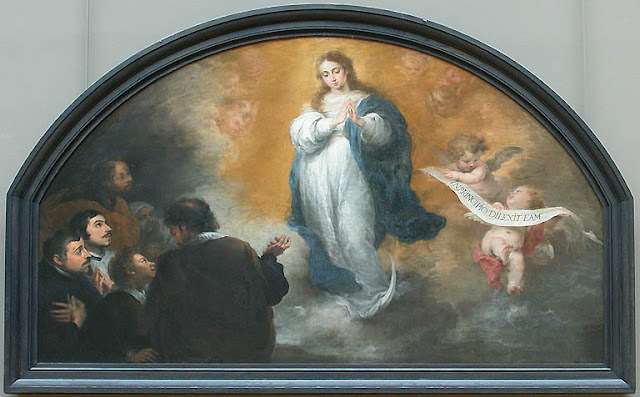 The dictionary defines it as “a special right or advantage that a particular person or group of people has.” Among human beings, Mary is undoubtedly the most privileged person. Why? Because she had been chosen by God to become the mother of his Son. Therefore, he filled her with a lot of graces, so that she could worthily accomplish the mission she had received. Bisogna riconoscere che La nuova bussola quotidiana costituisce, nell’attuale momento di crisi, uno dei pochi punti di riferimento rimasti — una “bussola”, appunto — per i cattolici italiani. I commenti pubblicati a seguito della vittoria del NO al referendum costituzionale di domenica scorsa ne sono, se mai ce ne fosse stato bisogno, una ulteriore prova: il commento a caldo di Alfredo Mantovano, l’editoriale di Riccardo Cascioli, il “focus” di Marco Berchi. 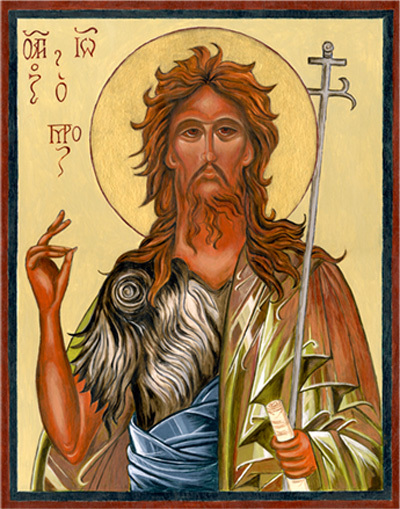 On the second Sunday of Advent one of the leading figures of this liturgical season appears, John the Baptist. The Catechism of the Catholic Church portrays him as follows: “[He] is the Lord’s immediate precursor or forerunner, sent to prepare his way … Going before Jesus ‘in the spirit and power of Elijah,’ John bears witness to Christ in his preaching, by his Baptism of conversion, and through his martyrdom” (#523).